Active solar air systems can effectively cover part of the heating demand for space heating, ventilation air and DHW of high-performance houses. Such systems have important advantages: solar air systems do not drip or freeze, and are simple, efficient and proven systems. Solar air collectors perform comparably to water-based flat-plate collectors; but the collector inlet temperature is, most of the time, lower than is the case with a water collector. This results in higher thermal efficiency. Furthermore, air as the heat transport medium allows for a simple collector construction; but the low density and heat capacity of air require a much higher volume flow to transport the absorbed energy. A disadvantage is the higher electric consumption of the fans compared to that of a pump in a water-based system. To achieve small pressure losses and electric consumption, the hydraulic design of the whole solar air circuit must be optimized. Generously sized air ducts, minimal duct lengths and no sharp bends help in this regard. 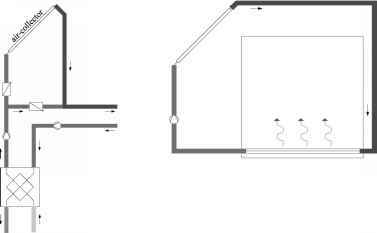 1 In solar radiant heating, the solar heated air is circulated in a closed loop (see Figure 12.1.1(b)) from the collector through the floor (hypocaust systems) or the walls (murocaust systems), providing radiant space heating (see Chapter 11, Section 11.2). 2 In solar-assisted ventilation systems (open loop), the solar collector preheats intake air after it has passed the heat recovery (see Figure 12.1.1(a)). This installation decreases the collector performance compared to an installation of the collector in front of the heat recovery, but the performance of the whole system is higher. It is an open-loop system in that collector air circulates directly through the occupied space. To increase the solar contribution, a combination of both systems is possible. The heating of DHW allows for all-year use of the solar resource and, hence, better economy and a much greater reduction in primary energy demand. For a high-performance house, the thermal mass of the solar radiant heating is preferred. This system uses the load-bearing structure of the house to channel the solar heated air, store the heat and radiate the heat into the room. Radiant heating provides excellent comfort and the storage delays the delivery of the heat to when it is more likely needed. To integrate an open-loop solar air system with a ventilation system, the only added costs are the collector, connecting air ducts and a controller. If the ventilation unit is close to the collector, these expenditures can be small. Some manufacturers of compact ventilation systems with integrated heat recovery already have prefabricated boxes to connect air collectors. Here, also, the installation and control are easy. A disadvantage of solar-assisted ventilation systems is that the air flow rate required for the house ventilation may not match the optimal air flow for efficient collector performance. Furthermore, on sunny days, there may be little or no need for ventilation heating because passive solar gains cover the load of the well-insulated house. As described earlier, the solar air collector and control devices are the only components to be added to a high-performance ventilation system. The collector is activated when it gains solar radiation and the temperature inside the collector exceeds the temperature of the fresh air having left the heat recovery. By an automatic control, a flap then opens and the air is blown through the collector, heats up and enters the air distribution inside the building. One of the main parameters for the system design is the air flow rate and the specific flow rate per m2 of collector. Dividing the flow rate by the specific flow rate of the collector, the result is the collector area. The specific flow rate is given by the collector producer; typical values are 25 to 50 m3/h m2. In high-performance houses, this leads to a resulting collector area with a maximum of 4 m2 to 8 m2. 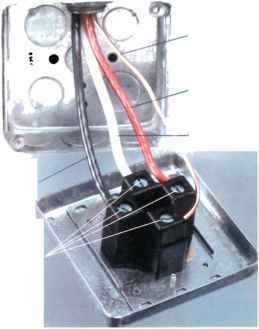 To keep the air inlet temperature to the room comfortable (a range of 20°C to 50°C), using a variable flow rate when the collectors gain solar radiation is recommended. By working with the lowest possible flow rate (given by the minimum ventilation rate) when the solar insolation is low and increasing the air flow up to the maximum flow rate to keep the collector outlet temperature within the given range, the solar gains can be maximized. Possible savings of energy depend on the energy demand of the house, its passive gains and ventilation air flow rate. A reduction of 10 per cent to 15 per cent of the heating demand can be achieved. However, the maximum flow rate is limited by the installed fan and distribution system because the pressure drop increases with increased air speed. An increase of the collector area and a higher volume flow is furthermore limited by the usability of the surplus hot air inside the building, which has to be proved by dynamic simulation. The usable solar gains are influenced strongly by passive solar gains and the building construction. Only heavyweight constructions allow for storing some of the solar gains and avoid overheating problems. In case of high passive gains, solar-assisted ventilation cannot be recommended. In this case, a solar-heated hypocaust system is the better alternative. To achieve a higher solar fraction, a parallel installation of both system types is an opportunity, which at the same time increases indoor comfort due to the radiant heating of the hypocaust. High-performance houses in most climates will not have a heating demand until late autumn, and then only through very early spring. Making use of the solar energy during the most sunshine hours in this extended summer season is important. 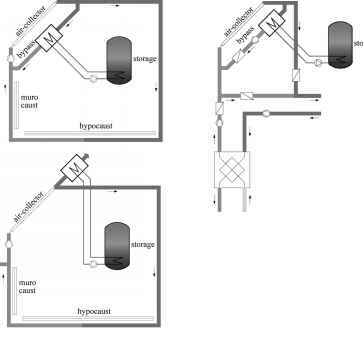 By installing a bypass between the inlet and outlet of the collector, and placing an air-to-water heat exchanger at this location, it is possible to use the solar air system to heat domestic hot water. In most cases, the solar gains in this mode exceed the gains for space and ventilation heating because high-performance houses need so little heating. Open-loop systems have the advantage of an installation with only a few additional components; unfavourably, the performance is lower (-50 per cent). As a result, open-loop systems are only recommended for large collector areas (> 15 m2) that are oversized for the purpose of DHW. • additional component: air-to-water heat exchanger with efficiency >80 per cent. The air-to-water heat exchanger can either be integrated within the hot water circuit directly or can be installed into a secondary water loop. The main issues to be solved for the different solutions are freeze protection and hygiene (see Section 12.2 and Chapter 13, Section 13.1 for information on the Legionella problem).